The colossal thud you heard over the weekend was the sound of "Titan A.E.," the new sci-fi epic from animator Don Bluth, doing a crash and burn. Who says sound doesn't travel in space? Cale (Matt Damon) and Akima (Drew Barrymore) from Don Bluth's animated sci-fi epic, "Titan A.E." In its first three days, "Titan A.E." grossed $9.5 million, opening in fifth place and disappointing the studio executives at Fox, who had hoped for an opening total closer to $15 million. After all, it isn't as if Fox made the same mistake Warner Bros. did with last year's underappreciated animated film, "The Iron Giant." While Warner Bros. made little effort to push its film, Fox aggressively marketed "Titan A.E." The first television ads for "Titan A.E." appeared months ago, including during the Super Bowl. As it happens, "Titan A.E." is a stunningly mediocre film, but that is beside the point. It should have at least gotten a good opening weekend under its belt and then been killed by bad word of mouth, but it couldn't manage even that. Sadly, it seems there is no market for animated films directed, not at children and families, but at teens and adults. And now that "Titan A.E." has failed in spite of Fox's massive advertising campaign, Fox and other studios will be hesitant to try again. That leaves only Disney -- and the Disney clones at DreamWorks SKG -- to produce an endless stream of mediocre films, few of which deviate from the Disney formula of dopey songs and annoying sidekicks. Animation is a wonderful storytelling medium, as the Japanese have demonstrated time and again. Japan's animated films range from children's fare (director Hayao Miyazaki's "Kiki's Delivery Service" and "My Neighbor Totoro") to cyberpunk action films ("Ghost In the Shell") to screwball, adult-oriented comedies ("Weather Report Girl") to graphic, psychological thrillers ("Perfect Blue") and horror ("Vampire Hunter D"). The anime sections of most video retailers are filled with excellent movies. Used skillfully, animation can be used to tell stories in ways simply not possible in live-action filmmaking, but we in America persist in thinking cartoons are just for children, and that limits what our animators can do. Now, Don Bluth would not be my first choice to try to bring animation to older audiences. Bluth started his career at Disney, but he left the Mouse Factory and got off to a spectacular start. His first non-Disney feature, 1982's "The Secret of NIMH," is an undisputed masterpiece. He followed that up with 1986's charming "An American Tail." Then the wheels fell off. Bluth started churning out soulless, sub-Disney hackwork: "Thumbelina," "Rock-A-Doodle," "All Dogs Go to Heaven," and the first of the never-ending "The Land Before Time" series. If you have children, you probably have some of Bluth's films in your video library. You also probably get cold chills whenever junior shoves one of them into the VCR. With "Titan A.E.," Bluth tried something new, at least something new to this side of the Pacific. He tried to meld traditional cel animation with three-dimensional computer graphics. 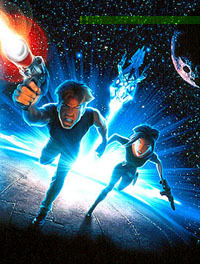 Computer animation has been used to supplement cel animation for years, but "Titan A.E." blends the two as never before. The computer graphics aren't simply an aide. They're essential. Bluth almost pulled off his experiment. There is no doubt about it -- "Titan A.E." is an eye-popping film. It looks great. The space scenes, the ships and the bad guys (a race called the Drej) are beautifully rendered, and with the exception of a few bad character designs, the traditionally animated characters are at least passable. The voice acting is also good, with Matt Damon as the young hero, Cale; Drew Barrymore as the starship pilot/love interest, Akima; Bill Pullman as the old soldier, Korso; and Janeane Garofalo, Nathan Lane and John Leguizamo rounding out the crew. Where "Titan A.E." falls apart is at the most fundamental level: the story. "Titan A.E." wasn't so much written as it was assembled. There is a bit of "Star Wars," a smidgen of "Star Trek II: The Wrath of Khan" and a great, whopping heap of E.E. Smith's "Lensman" novels, the last by way of the 1984 "Lensman" animated film from Japan, which was also a mix of computer and cel animation. Everything that happens in the film is a clich�. As I said, animation is a wonderful storytelling medium, but it helps to have a story worth telling. Hopefully, Bluth hasn't ruined it for everyone else, and some other filmmaker will get a chance to make a solid, adult-oriented animated film. Hopefully, next time, the public will be willing to give it a chance. Until then, I'll just keep looking to Japan.